This 100% cotton t-shirt is a top choice for youth clubs, schools and camps. 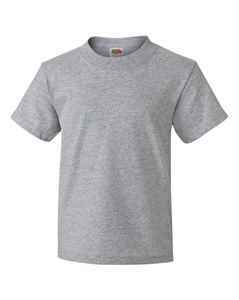 This custom t-shirt features a rib crew neck collar, hemmed sleeves and bottom with a tear-away tag for optimal comfort. This superb, lightweight cotton t-shirt is perfect for kid’s teams and clubs. The 100% cotton material is perfect for custom printing, meaning kids can display the logo of their sports team or club with pride. Kids will feel comfortable and look great all day long in this pre-shrunk custom t-shirt with its excellent taped shoulder-to-shoulder design. When we say the Hi-Densi Youth T-Shirt is fully customizable, we really mean it. Available in 18 colours and ready for your logo, numbers and names, this is the natural choice for custom clothing. Whether you run a sports team, extracurricular club or summer camp, kids will love displaying your logo with this great custom t-shirt. Get your kids’ team personalized without breaking the bank - order this superb cotton t shirt today!